Welcome to FreeAirPump.com, an ever-growing list of places that provide free air for tires. Are you fed up with paying $0.75 to $1.50 just to fill up one of your tires? Think it’s ridiculous to have to swipe your credit card to get access to something that should be free? 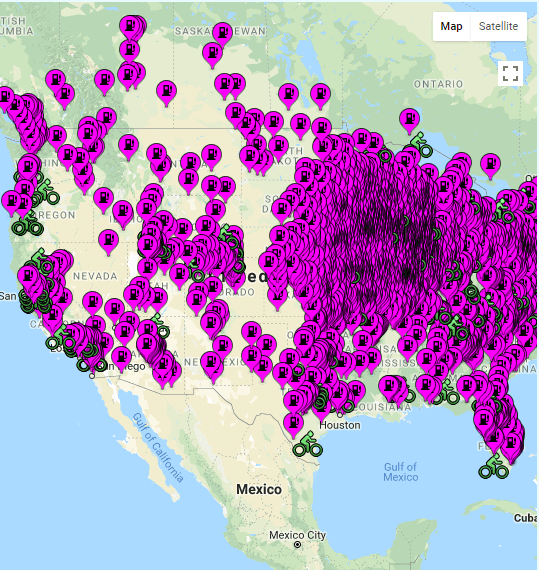 FreeAirPump.com provides a map of locations that offer free air for tires. See where to get free air for tires. The FreeAirPump.com map contains plenty of gas stations that have free air for autos. For bicyclists, you can also find numerous bike repair stations or stand alone bike pumps listed. If you know of a place in your neighborhood that provides air for free, then head over to the Add a Location tab and submit your own free air location to help others across the nation. Please note that this list of places is mostly user-generated, and by no means should be considered definitive. We have spotted all the places in the map below so you can easily find them. The bicycle logo indicates either a standalone bike pump or bicycle repair/fix-it station. Help us expand this map by submitting new locations, or by pointing to us any errors if you find them. Can’t find any place offering free air near you? If you have the dough, you can get a portable air compressor / inflator to carry around in your trunk, or use at home. Here’s a guide with the best available choices in the market right now, along with a detailed explanation of the whys and the hows. Those of you living in Connecticut already enjoy the sweet serenity of getting free air at gas stations. The only spots on the map in that state are for bicycles. In California, free air is the law – but only for paying customers. For the rest of us, check out the map and find free air for tires near you! Save money! Save gas! Go fill up your tires for free! Check out our blog for helpful hints on increasing your mpg, green energy news, and anything else that can help make your life easier. Find helpful and friendly bike shops on our map that not only offer free air, but an array of products and services to keep you cycling longer. Free air is not a thing of the past!